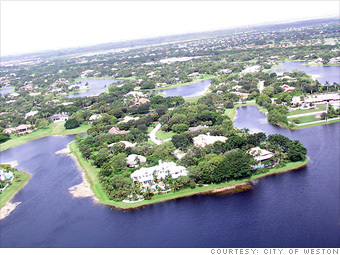 Because Weston is a planned community, local realtors often say that "everything is located exactly where it should be." Golf courses dot the landscape, and Weston Regional Park is a weekend destination for families. The venue for the Florida Panthers hockey team is just a short drive away. Carved out of the Florida Everglades, Weston is a bedroom community for commuters to Fort Lauderdale and Miami � but the area's popularity leads to gnarly morning rush hour commutes.